London’s beer-drinking scene is dominated by two colossal, perennial beer festivals this month. We preview them both here, alongside a couple of more modest beer drinking opportunities. It’s another year and another new venue for London Craft Beer Festival, which will be taking place in Wapping’s Tobacco Dock over the first weekend of the month. As before, tickets follow a (mostly) ‘all-inclusive’ model, where you pay £46.50 for entry to a five-hour session on Friday or Saturday (or £39.50 for Sunday’s session, or £150 or access to all sessions), then enjoy unlimited 100ml pours of any of the beers being served, as well as cider, wine, gin, whisky, and soft drinks. A branded tasting glass is also included in the entry price. 90-ish brewers, from the UK, Europe, and further afield (e.g. Canada, Australia, New Zealand, South Africa, USA) are set to feature, so there should be a very wide variety of beers to sample, and food (not included in the ticket price) will be served by half-a-dozen well-curated ‘street food’ stands. As the London Craft Beer Festival is marketed towards the ‘cooler’ end of the beer-drinking market, a musical accompaniment forms a large part of the festival, with DJ sets from a handful of fairly recognisable names. However, the festivities are not exclusively hipster — it’s good to see the return of the ‘Fuller’s and Friends Cask Yard’ to remind punters that cask-conditioned ale still deserves a place at a ‘craft beer’ festival. 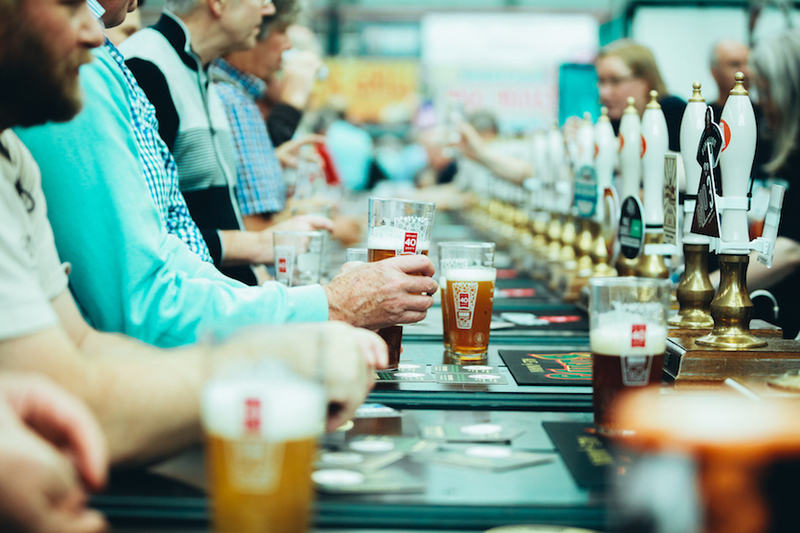 For many ale-aficionados, CAMRA’s annual Great British Beer Festival (a.k.a GBBF) forms the pinnacle of the year’s beer festival calendar. Its customary six-day run will pack the vast Olympia exhibition hall with something in the region of 1000 different beers from more than 400 brewers, as well as roughly 100 ciders and perries. As you’d expect from a CAMRA festival, much of the focus will be on cask-conditioned ales from UK brewers, but the festival still features four large bars dedicated to beers from overseas, including the fascinating ‘International Cask Bar’, showcasing a large selection of cask-conditioned beers from the USA. As always, a wide variety of satisfyingly unhealthy food will be available to help soak up the beer. On previous visits we have regularly found ourselves obsessing over the magnificence of the pork scratchings sold at the Crusty Pie Company stall, but others will invariably have their own favourite festival foodstuffs. Aside from the drinking and eating, further stimulation can be gained from live music (usually ignored by most GBBF punters), and some limited-availability tutored tastings (which require additional pre-booked tickets). Tickets to each day’s session cost £11 in advance (or £14 on the door) — check the exact opening times for each day as the public Tuesday and Saturday sessions are shorter than those on the other days. The Cotton Mill micropub in Swanley, just about within the M25, will be hosting its ‘Beer Bash’ from 4-5 August. Head over for local beers, wines and ciders, as well as barbecued food, live music, and other attractions. The annual beer festival at Woodies Freehouse in New Malden will be taking place from 17-19 August. Alongside a selection of real ales and ciders, the festival’s publicity promises a selection of craft beers “for the first time”. Mind-boggling stuff.